Following Consensus Trades worked in 2013 and 2014, and started to lose some money in 2015. After running the numbers, we were shocked to see this developing consensus underperformance trend accelerate by 1270bps for 2016. We analyzed Thomson Reuters’ I/B/E/S dataset and looked at instances where analysts were unanimously bullish or bearish on a stock. It turns out that analysts recommendations correlated strongly with share price performance. However, there was one tiny caveat: the buys dramatically underperformed the sells in 2016. The unanimous buys were up 4.5% while the unanimous sells were up 20.7% so a market neutral consensus portfolio lost ~16.2% last year. It turns out that 2016 was a year where betting against the analyst herd paid off! 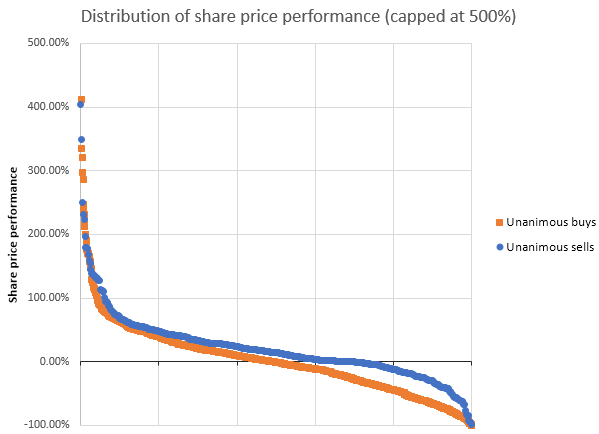 The chart above shows the distribution in share price performance between both cohorts. (The bullish group had outliers up +1618% and +1189% that are not shown.) While the winners in both groups performed roughly the same, the losers in the bullish group fell more than the bearish group. One major factor behind the underperformance was the bullishness surrounding small-cap development-stage pharma stocks. For healthcare stocks (which were mostly small-cap pharma names in our cohorts), the number of consensus buys outnumbered the sells by a factor of 13.7X versus a baseline rate of 2.24X. We looked at stocks where either (A) every analyst on a stock had a buy rating or (B) every analyst had a non-buy rating as of Dec 17, 2015. A stock with 100% holds and 0% sells would fall in the bearish group since it had 0 buy ratings. Our look at analyst ratings basically considers holds to be a polite way for an investment bank analyst to put a sell rating on a stock. Please take our data with a grain of salt. This was a quick analysis where we used share price performance instead of total return. Performance ignores dividends, corporate actions, survivorship bias, and stock borrow/lending fees. Where price data was unavailable or had errors, some stocks were omitted. The unanimous buy cohort was quite bullish towards the healthcare sector. 315 out of the 1031 unanimous buys were for healthcare stocks, while 23 out of the 459 unanimous sells were for healthcare stocks. That’s 30.55% of the buy cohort compared to 5.01% of the sell cohort. This was a very unusual imbalance. Also note that the fixation over biotech has been growing over the past few years. Since Dec 2012, healthcare stocks have grown from 20.77% of the buy cohort to 30.55% of the Dec 2015 cohort. In that same timeframe, healthcare representation in the sell cohort fell from 5.80% to 5.01%. The next most imbalanced sector was technology, which made up 12.42% of the Dec 2015 buy cohort and 7.84% of the sell cohort. Technology was not nearly as imbalanced as healthcare. Keep in mind that the “healthcare” stocks in our cohorts aren’t the Pfizers and Mercks of the world. Due to small sample sizes, small cap stocks are significantly over-represented. Small caps are more likely to have a unanimous consensus especially if there is only 1 analyst rating a stock. (We could reduce the sample size problem by requiring a minimum of 5 ratings. This would widen the performance gap for 2016.) So, the “healthcare” stocks in the cohorts are actually mostly small-cap pharma stocks. So, biotech exposure partially explains the performance gap but does not explain everything. Suppose that we removed all healthcare stocks from the Dec 2015 cohort used for the 2016 performance figures. This would reduce the spread from 15.5% to 7.1%. Removing distortions caused by sector exposure shows that the spread has roughly averaged out to zero over the the past four years (with perhaps a slight edge to the buys). However, the unanimous buys have been on the wrong side of predicting where sectors have been headed. Over the past four years, the sells have outperformed the buys by about 1.6% annualized if sector-weighting differences are included. Due to limitations with the methodology, reliable conclusions cannot be drawn about whether or not analyst recommendations can help predict stock prices. As well, the numbers here likely do not generalize to all investment analysts polled by I/B/E/S. Prestigious bulge-bracket investment banks, star analysts, and independent research providers (that do not seek investment banking business) are likely severely underrepresented in the cohorts. Will biotech giveth or taketh away? What we can safely conclude is that 2017 looks like yet another year where biotech will be a major player. 30.87% of unanimous buys (from Dec 15, 2015) were for healthcare stocks- slightly higher than the previous year where that number stood at 30.55%. There seems to be a segment of the analyst community that is unusually exuberant about biotech stocks. It will be interesting to see whether or not their optimism becomes reality. Barber, Lehavy, McNichols, and Trueman wrote a paper “Reassessing the returns to analysts’ stock recommendations” that examines the value of analyst recommendations from 1986-2001. Their conclusion? Even with their poor performance in 2000-2001, for the longer (16-year) 1986-2001 period, the most highly recommended stocks still generated significantly greater average annual market-adjusted returns than did those least favored (2.44 percent as compared with -9.94 percent). These relative returns reflect favorably on the long-term value of analyst recommendations, as long as the 2000-01 results are simply an aberration that is unlikely to be repeated.